If you want to add and option to enter an invoice number or other custom field in Cardpointe online, this video will show you how. You’ll come over to ADMINISTRATION tab and click the USER FIELDS sub tab. As you can see there are 10 open user fields that you can customize. So let’s add an invoice number and a General Notes field to our receipt by checking this box to make each of those two fields active. I have prefilled these labels into the account that you’re seeing right now so in your account these boxes will be blank. The LABEL column is the title of the field descriptor and is what shows up on virtual terminal screen once you save these changes. 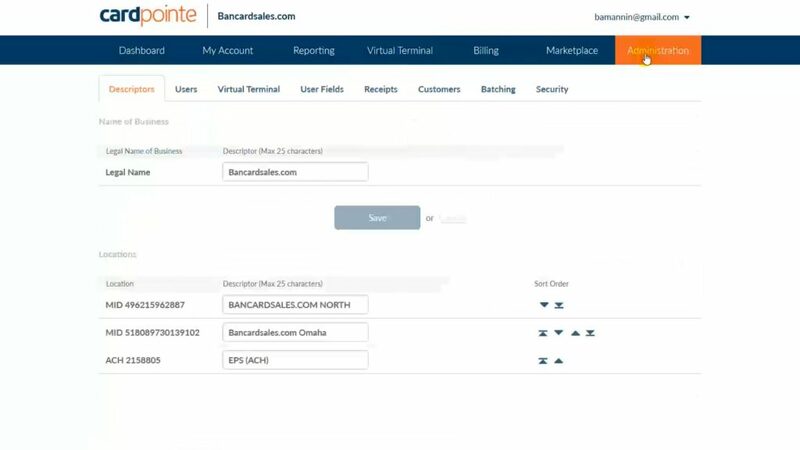 You have the option to add each unique field to either the customer profile or the transaction detail section on the virtual terminal screen. We’ll click back over there in just a second to show you what I mean. I’m gonna make the invoice number required by checking this box here… and the general notes will be optional so I’ll leave it unchecked. When I scroll down you’ll see the new fields have been added. You can also see that it has an astericks next to it denoting a required field in order to process the transaction. These additional fields will show up on the transaction details page when you go into the reporting tab and view this transaction.